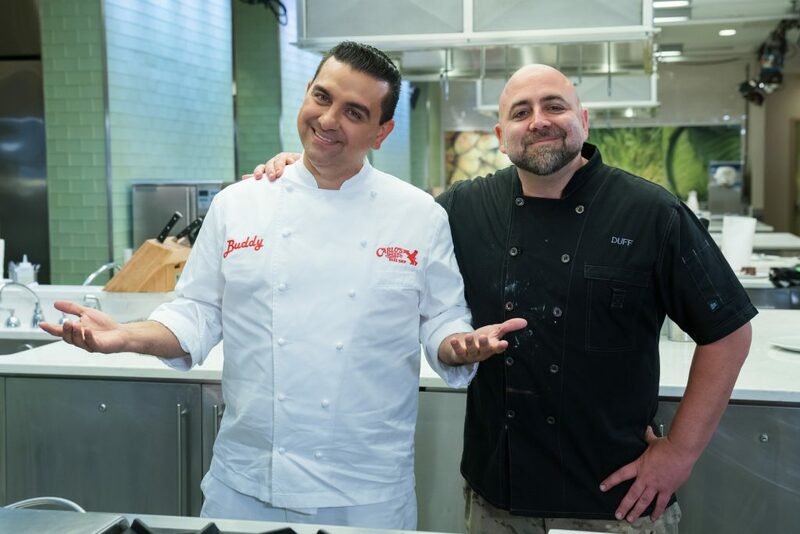 Elite bakers Buddy Valastro (“Cake Boss”) and Duff Goldman (“Ace of Cakes”) face-off in an epic baking battle for the chance to be crowned the undisputed king of cake on new Food Network series “Buddy vs. Duff,” premiering March 10 at 9pm ET/PT. The 6-week competition will challenge every aspect of what it means to be a true pastry artist and cake master. From techniques, to design skills, and taste, each episode will measure their talent in two rounds – a Bake-Off to test their baking abilities, followed by a Cake-Off to showcase their creative imaginations and decorating expertise. Renowned chefs Sherry Yard and Keegan Gerhard are joined throughout the competition by special guest experts including, Florian Bellanger, “Street Science’s” Kevin Delaney, “Flip or Flop’s” Christina Anstead, Hannah Hart, Waylynn Lucas, Penn & Teller, Gesine Prado, “Fast N’ Loud’s” Richard Rawlings, Aarti Sequeira, and many more, to help determine the winner. The pressure is on as the two biggest names in cakes put it all on the line in this ultimate cake-off! The competition is fierce as Buddy and Duff pull out all the stops and push their creativity to the limit in each challenge as they whip up impressive creations. The battle begins as Buddy and Duff must make their most beloved family recipes in the first Bake-Off. Then in the Cake-Off round, they must construct car-inspired cakes with all the bells and whistles. Throughout the season they will be challenged to create carnival treats to impress a crowd of hungry amusement park patrons, dazzle with intricate Bollywood-inspired cakes, and satisfy customers during the morning rush at the iconic Randy’s Donuts in Los Angeles. If that’s not enough, they must also design desserts for an exclusive dog pampering party, impress a couple with elegant wedding cakes for their big day, and enchant audiences with illusion cakes for a special show at Hollywood’s Magic Castle. In the finale on Sunday, April 14 at 9pm ET/PT, Buddy and Duff face their toughest challenge yet. For the final Bake-Off, the two chefs must work to make their most heartfelt and monumental creations yet – chocolate desserts to conceal engagement rings for surprise proposals. Then in the final Cake-Off, their skills are pushed to new heights, as Duff returns to Charm City Cakes and Buddy heads back to Carlo’s Bake Shop to work on their final show-stopping space-themed cakes. After weeks of intense competition, it all comes down to these out-of-this-world creations. Fans can get an insider’s look at the show with Buddy and Duff at FoodNetwork.com/BuddyVsDuff. Plus, watch bonus videos with the judges and guests that will bring you behind the scenes, and follow the action on social media using #BuddyVsDuff.